HIGH POINT, N. C. (April 2012) - Look up the words "classic" or "historic" in the dictionary and you just might find images of Marge Carson's new Trianon Court Collection. 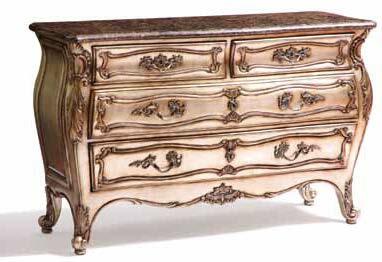 This stunning 22-piece group finds its inspiration in King Louis XVI's period of rich design, translating it into a powerful bedroom, dining room and occasional collection. "Marge Carson is not a reproduction manufacturer but, rather, one that adapts the classics to today's lifestyles," says Director of Design Mike Gohman. 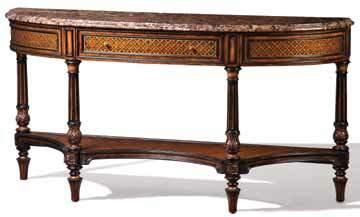 "Louis XVI is a well-established era of classic design, and our research found more than enough to draw from. Our bigger problem was not in deciding what to do, but what not to do. I must admit, it was hard to leave some items behind." According to LaBarge, Marge Carson occupies 29,000 square feet of the building, leaving several additional showroom spaces for rent at competitive rates. Prior to the April 2012 market, the company plans to update the exterior and install a new roof and air conditioning system. Expertly crafted of plantation-grown white teak solids and exotic veneers, the Trianon Court Collection features two new Marge Carson finishes. "Oxford Noir" is a unique two-tone finish in which contrasting light and dark wood tones separate surfaces, revealing an Old World charm and grace not found in your typical antiqued wood finish. "It highlights the layers and different depths of each surface in a way that adds a great deal of visual interest," says Gohman. "It is best suited for traditional product that has a variety of veneered surfaces and carvings, and was ideal for Trianon Court." The second new finish, "Pompeii," might simply be described as taupe, but it is that and so much more. "Taupe is like the dawn of color before you see it in its full richness," Gohman explains. "Marge Carson's new Pompeii finish finds that magical moment through a combination of metal leaf that is burnished to subtly reflect that glint of light, then highlighted with a soft warm glaze and a pampering of dry brushing." There's also a magnificent 124 x 52-inch extension dining table, crafted of white teak solids with a marquetry top made up of white ash burl veneers that are cross-banded in walnut inlays. Accompanied by chairs with wroughtmetal filigree inset backs and a shapely 92-inch credenza with a polished madeira marble top, the result is a rich and elegant setting that elevates everyday living to a standard that, at one time, only royalty could enjoy. Two distinctive beds are among the signature pieces of this collection that returns us to a more romantic time and place. 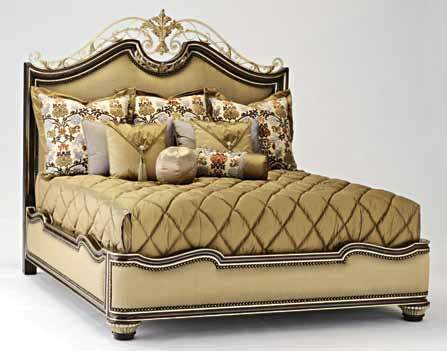 One is an intricately carved poster bed, accented with diamond-quilted upholstery at the headboard and footboard. The other features bedding that is surrounded by carved and upholstered side and foot rails, then backdropped by a spectacular headboard which features hand-wrought metalwork and forged foliage across its carved top. While Marge Carson respectfully pays tribute to the past it's ever mindful of the present, too, evidenced by the contemporary Bossa Nova Collection. "Each has a place in the collective worlds that we live in," says Jim LaBarge, the company's owner and CEO. 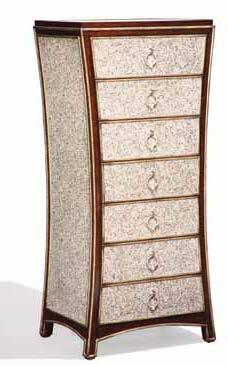 "The Bossa Nova Collection is fanciful yet sophisticated.  It takes the soft curve of a line, defines it, then intertwines it into a collection for contemporary living." The 25-piece collection - characterized by rosewood veneers, ebonized inlays, plus leather and mirror insets - makes for an eye-appealing experience. 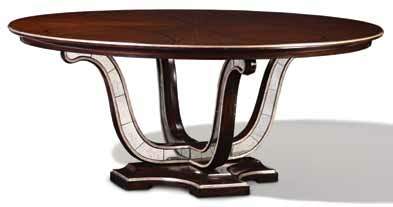 The base of a round dining table, for instance, uses the curve of that "line" to border panels of inlaid antique mirror. But it's the metal work that is the signature element of the collection, like hand-fabricated metal that laces together to form a sculptural base for a sleek rectangular dining table top of rosewood veneer and ebonized inlays. 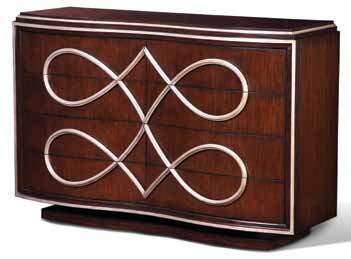 From a rosewood chest set on a pedestal base - with "infinity" laced moulding serving as drawer pulls - to a spectacular display cabinet with a wood mullion that swirls up through its glass face like a spiral to heaven, even an hourglasscurved lingerie chest and a dramatic bar/entertainment cabinet set on reeded tapered legs, Bossa Nova's perfect rhythm is pure delight.